Climate change and environmental pollution now seem to be constant themes in our news cycle, with young people increasingly demanding more forward-looking responses from their communities and governments. 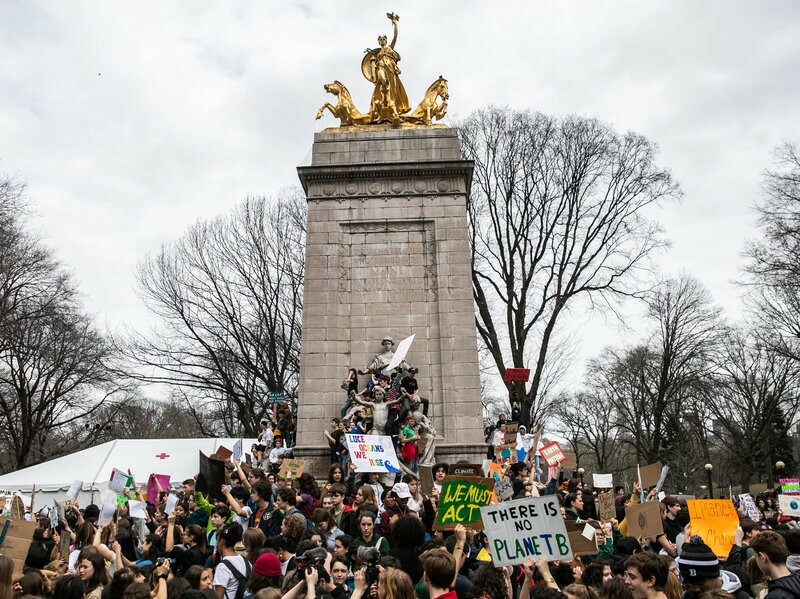 As this past week’s continuing global climate protests illustrate, environmental concerns are a top consideration for many young people, both in regards to the politicians they support and the establishments they patronize. This concern seems to be grounded in a hard truth, as we are inundated with frequent reminders that we only have 20, 15, or 10 years to right our ship and prevent global warming from exceeding the 1.5 °C increase so commonly cited as a crucial tipping point. Climate change demonstrators in New York City. Photo from NPR. In a previous article, I discussed an innovative nanoscience-based approach some climate scientists are considering to combat this warming, but if we are to adequately respond to a problem as large and multifaceted as climate change, we will need an equally multifaceted approach. Plastic and single-use packaging present another difficult challenge to overcome. Single-use plastics (including plastic shopping bags and water bottles), whether discarded carelessly on roadsides or in the trash, have become somewhat of a symbol of our lack of environmental stewardship, as exemplified by the Great Pacific Garbage Patch, a large jumble of microplastics inhabiting a swath of Pacific Ocean between California and Hawaii. Recycling of many plastics can be a great way to reduce their environmental impact. Unfortunately, many plastics are not recycled, even if they are placed into recycling bins. Plastics encompass a much broader category of materials than metals, with the plastics used for juice bottles being a completely different class from those used for trash bags, for example. This diversity makes their sorting a very real logistical problem, especially since we tend to lump all recyclables together into a single bin. Many plastic items are also composed of multiple components, the separation of which may not be feasible. The hard truth is that nearly 91% of plastics are not recycled, meaning that they will end their lifecycles in a landfill, or in the ocean. In order to combat this problem, some forward-looking companies have begun exploring alternatives to traditional high-waste plastic products. A prominent example of this is Starbucks, which has vowed to completely cut its use of plastic straws worldwide by 2020, a move expected to remove more than a billion straws per year from circulation. Moves like this are more than environmentally friendly, they’re good business sense. Young people are increasingly likely actively seek out companies that promote environmentally friendly and sustainable business practices. While these reduction-based policies are certainly a welcome step toward reducing the amount of single-use plastic that ends up in the landfill (or the ocean), it is clear that a paradigm shift is needed if we are to avoid the worst consequences of our negligent stewardship. Some innovative companies are taking on this challenge in unique and creative ways. Evoware, an Indonesia-based company that produces alternative packaging materials, offers a range of materials sourced made from responsibly-sourced seaweed. 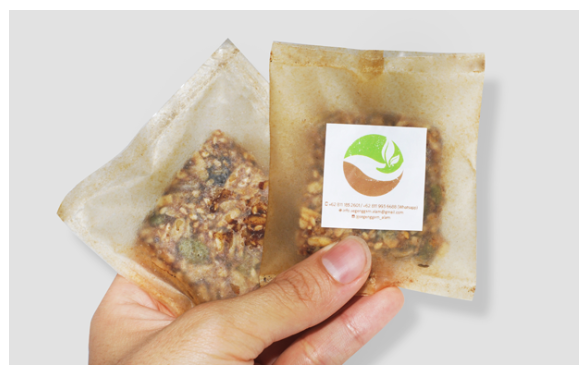 This packaging material is food-safe, and is even edible! Sourcing packaging materials from natural and renewable sources can lead to positive downstream effects. For instance, seaweed is a zero-input crop that sequesters carbon and nitrogen from the ocean, producing oxygen and mitigating ocean acidification. Seaweed farms can also help regenerate reefs and local ecosystems, and even bring commercial opportunities to rural farming locations. Seaweed-based materials have attracted popular attention in recent years, even winning top prize at the 2016 Lexus Design Awards. At the moment, further material developments are needed to make these materials useful outside of the packaging of dry goods such as grains and cereals, but higher-tech alternatives are already being manufactured on a commercial scale right in our own backyard. Seaweed-based packaging is compostable, and even edible, and could be a novel strategy toward tackling single-use plastic waste. Image property of Evoware. Danimer Scientific, a Georgia-based manufacturer of biopolymers, has recently begun producing compostable and biodegradable plastic packaging materials from canola seeds. 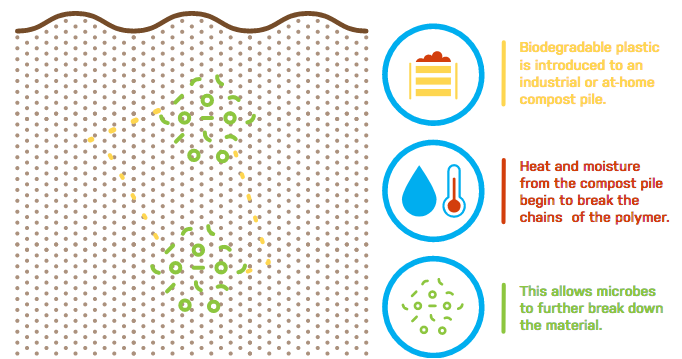 Through a process of bacterial fermentation, the canola oil is converted into polyhydroxyalkanoate (PHA), a water- and oxygen-proof material that is biodegradable, home-compostable, and compatible with traditional melt-extrusion processing (Danimer has a great visual of their process here). Danimer has recently teamed up with Coca-Cola and Nestlé to develop biodegradable chip bags and water bottles, respectively. Whatever you think of these companies, it’s encouraging to see these new and sustainable materials being explored as scalable alternatives to traditional single-use plastics. Danimer Scientific is pioneering the large-scale development of completely compostable plastics for use in food packaging, shopping bags, utensils, and other applications. Image property of Danimer Scientific. Each year, it becomes clearer and clearer that climate change poses an existential threat to our established way of life, especially for those of us young enough to expect to live through the worst of its consequences. Our breakneck rate of consumption of single-use plastics is just one symptom of our collective diffusion of responsibility, and is leading to devastating consequences for many natural habitats around the world. New strategies are needed to tackle these challenges, and we are beginning to see creative and practical application of alternative materials that could replace some of our most waste-generating plastics. This is just one of a handful of responses that will be needed if we are to adequately address the many-faceted puzzle that a changing climate poses, but it is also a dose of reassurance that we might have the collective creativity and ingenuity to meet these challenges head on after all. Originally published at dominikstemer.wordpress.com on March 19, 2019.